Here are our booking conditions. Please read these carefully as they set out the terms of the contract that you will enter into when you make a booking with Mill Cottage Holidays. Please contact us if you have any questions. Weekly bookings run from Friday to Friday. Short breaks generally run from Friday to Monday or from Monday to Friday. Their availability is shown on the book-on-line page of this website. On the day of your arrival, your cottage will be available from 4.00 pm. Please let us know if you will be arriving late so that we can arrange entry. On the day of departure, you must vacate the cottage by 10.00 am. Our prices are inclusive and quoted in Pounds GB inclusive of VAT at the prevailing rate. Payment may be made by cheque (made payable to 'Barbara A Biesterfield'), by bank transfer, or by credit / debit card on-line. Only the persons listed in the booking request, or notified to us and accepted by us afterwards, may stay in the property. The maximum occupancy of the property must not exceed two. Bookings will not be accepted from single persons under the age of 25 years without our prior agreement. The contract between us is for a licence to occupy the accommodation for the duration of the holiday let and no tenancy is created. For the comfort of all of our guests, pets, including dogs, are not permitted. Smoking is not permitted at Mill Cottage. Once you have booked your stay with us and we have accepted your booking, our agreement is a legal contract and any deposit you may have paid is non-refundable. If you need to cancel, please contact us immediately and confirm it in writing. For holidays cancelled by you, you will remain liable to us for payment of the total cost of the holiday and we are under no obligation to relet the accommodation. However, if do re-let the accommodation, all monies paid in excess of the deposit will be refunded, less any shortfall in the rent achieved, taking into account any discounted rent applied to secure an alternative booking, and a £100.00 administration fee. We will only cancel your booking if your accommodation becomes unavailable for reasons beyond our control. In this unlikely event, we will attempt to offer you alternative dates. However, if this is not possible or unacceptable to you, we will refund all monies paid by you. Whatever the circumstances, our liability to you will not extend beyond a full refund. We shall not be responsible for any consequential loss. The accommodation must not be shared with anyone not named on the booking form nor may you part with possession of it and the number of persons using the accommodation must not exceed two. This shall not affect your ability to, for instance, have friends for drinks or supper to a limit of six. Please take good care of our accommodation and the furniture and equipment. Whilst we employ a housekeeper, guests are expected to leave the cottage in a neat and tidy condition with all bins emptied and all dishes and glassware washed and put away. You are responsible and liable for any damage or breakages which you cause to the accommodation or its contents, including furniture and equipment. We do not normally charge for minor breakages, but you will be held responsible for the full costs of cleaning, repair or making good if we consider that the damage or breakage is significant. Please report any damage or breakages as soon as they occur. The contract is between Mill Cottage Holidays and the person or persons in whose name the booking is made. That person or persons shall be liable to Mill Cottage Holidays, on a full indemnity basis, for the acts and omissions of any third party at Mill Cottage with their consent or acquiescence, including for any damage or breakages which they may cause to the accommodation or its contents, including furniture and equipment Save for damages for death or personal injury caused by the negligence of Mill Cottage Holidays, we do not accept any liability for any damage, loss, injury, sickness or inconvenience to you or any member of your party, or to any vehicles or possessions belonging to you or any of them, howsoever caused. Nor shall we be liable for any additional expenses incurred by you or any member of your party whether directly or indirectly caused by or arising from any aspect of your booking with is. Under no circumstances shall our liability to you exceed the amount paid by you to us. We will endeavour to ensure that the content of this website is always accurate, honest, and up-to-date. However, all content, including prices, is subject to change without notice and we cannot accept liability for the performance, standard or quality of any third party venue, goods or services referred to in our marketing or other material (for instance, any Information Pack). Links to external websites may be provided as a service to our users, e.g. where they contain information that may be of either general or specific interest to persons planning a self catering cottage holiday. However, we are not responsible for the content, views, or accuracy of information on external websites. 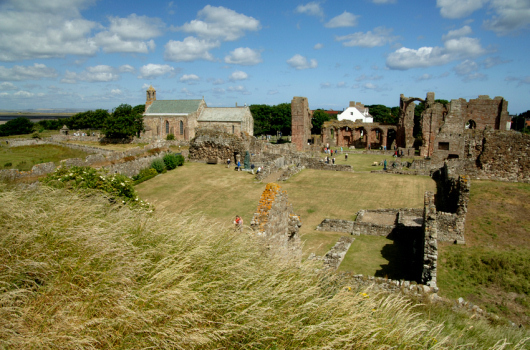 All local tourism images in this website are copyright of the photographers who provided them, including Britain on View, iStockPhoto, Northumberland Tourism, and others, whose contributions we gratefully acknowledge.